So sorry this is so late and not the usual format! But this is sort of a outfit and a sunday post in one! 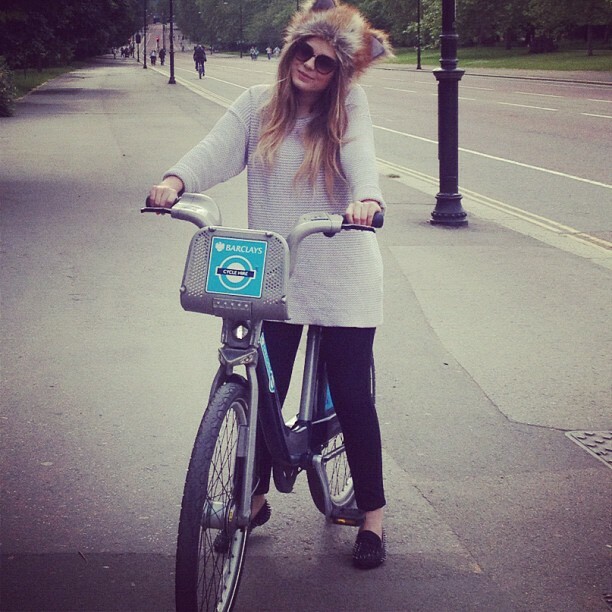 As you can see from the photo I went Boris Biking today in Hyde Park which is amazing! I highly recommend doing it if you visit London or live in London and have been thinking about doing it! I felt really ill this morning (hangover, standard!) so it was nice to go out and do something and make the most of my time in London! We also went to Yo! Sushi and took advantage of one of the deals they have on at the Fulham Broadway restaurant where all the plates are £2.12! I'm off on holiday on Tuesday! I'm going to Turkey for my usual family holiday! We go every year and it will be lovely to see the family again! The thing Im most looking forward to is seeing the sun and relax! I still haven't packed so Im sure I'm going to be spending most of tomorrow in pre holiday panic but oh well! Worth it while Im there! If you have any things that you always seem to forget to take on holiday pop it in the comments as Im bound to forget something really important that I need! As per usual Im going to be blogging on here while Im away, probably just random snaps and outfits but I've preplanned all my other posts for ETCLLYMLRS. Im actually going on holiday twice, so Im going to Turkey for two weeks, 10 days back and then off again for another week. Jet set life style or something like that! Also thanks to everyone who's commented on my new hair! I really love it and I'm glad you guys do too! So much love for the Lisa Shepherd Salon! Im currently sitting with my favourite hair mask the Phillip Kingsley Elasticizer to try and get it back into a somewhat decent condition! I haven't re-done my hair in months so forgot just how much bleaching it dries it out! There are Boris bikes right outside where I work yet I still haven't been on them! Massive well done on getting out the house with a hangover, I cannot do it! That hat is adorable! You look lovely, I was also cycling today - Bristol's Biggest Bike Ride! I just love those Boris Bikes, I wish I could ride everywhere on them! Aww you look so sweet in the picture! you are soooooo cute ! I can't wait to go Boris biking! My boyfriend and I always debate it but never actually do it! You look so sweet, I love the Monki jumper! So jealous that you're jetting off to the sun, cannot stand all this rain at the minute!! Adorable in that hat. Love it. i love this! can't wait to move to London in September! This looks like a magazine shoot! Nice relaxed Sunday outfit. Enjoy seeing some sun! im going to london at the weekend! i'm going to hire a bike! Deodorant, pajamas and my hair straightener are the things I almost always forget. Never all at once, just usually one at a time. I also forgot to pack shoes once. That was an interesting weekend away. Have a lovely time, I did a post a few days ago on how to pack, feel free to check it out. Although not if you want to travel lightly, it contains most things but the kitchen sink! I always seem to forget my toothbrush when I go on holiday. Thank god that's something you can buy all over the world! Ahhh super jelous you're going to Turkey, i got back home last Thursday from 2 weeks in Marmaris and i want to go back! Have an amazing time.